Viewed as a PDF, this is a section from a court order signed by three federal judges appointed by the President of the United States. 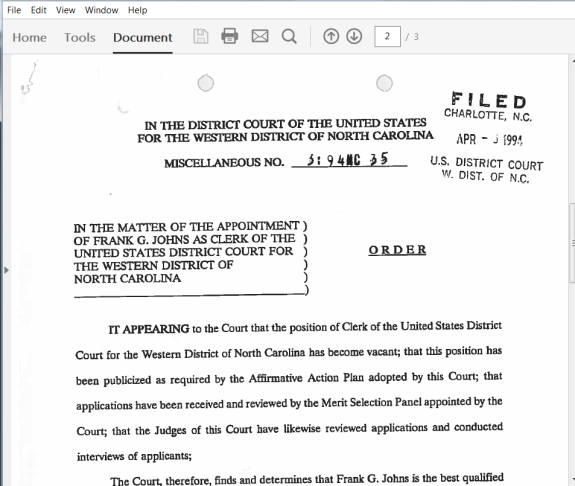 The order from April 1994 officially appointed Frank G. Johns clerk of the U.S. District Court for the Western District of North Carolina. UPDATED 9:21 A.M. EDT JULY 2 U.S.A. As the PP Blog reported on June 25, at least one odd sideshow is occurring while court-appointed receiver Kenneth D. Bell is pursuing clawback actions against alleged “winners” in Zeek Rewards. A filing docketed June 23 and attributed to Canadian alleged winner Catherine Parker led to questions about whether Parker, of Hamilton, Ontario, was a “sovereign citizen.” Parker is facing a default judgment of nearly $214,000. Among other things, the June 23 filing attributed to her accused longtime U.S. Court Clerk Frank G. Johns of the Western District of North Carolina of dishonoring his office. Johns has held the office for more than two decades. Such tactics are consistent with filings by “sovereign citizens.” It is unclear whether Parker adheres to the bizarre “sovereign” ideology, some of which surfaced in the AdSurfDaily Ponzi case and ultimately led to criminal charges and convictions against ASD story figure Kenneth Wayne Leaming. Leaming acted out on some of his legal fantasies, ultimately participating in the filing of bogus liens against U.S. judicial officials. “Sovereigns” sometimes don’t know when to stop, and escalations often land them in trouble. Chief Deputy Clerk Terry T. Leitner of U.S. District Court for the Western District of North Carolina responded to the June 23 filing attributed to Parker today. In response to your request for a copy of the oath of office form for Frank G. Johns, Clerk, U.S. District Court, this office does not release copies of personnel documents. This letter will confirm, however, that Frank G. Johns was appointed Clerk of the U.S. District Court for the Western District of North Carolina on April 11, 1994. The oath of office taken by a Clerk may be found in the United States Code at 28 USC Section 951. Attached is a copy of the Order appointing Mr. Johns which is public record. Included with the Leitner letter was a copy of a 21-year-old court order from April 1994 that appointed Johns clerk of the district. Three judges signed the order, including then-U.S. District Judge Graham C. Mullen. The order was signed on April 5, 1994. It went into effect on April 11 of that year. Mullen, who is hearing the Zeek clawback cases, went on to become Chief Judge of the district. A former Naval officer, Mullen is now a Senior District Judge. He also is presiding over the SEC’s Ponzi/pyramid action against Zeek brought in August 2012. The June 23 letter attributed to Parker appears to contend she entered a defense to the clawback action in October 2014 but that the defense never was entered into the record of the case. Johns entered a clerk’s order of default judgment against Parker on Jan. 6, 2015. The letter requesting the clerk’s oath was filed more than six months later. It complained about Parker’s name being presented in all-caps and accused two attorneys working for the Zeek receivership of dishonoring the court. The June 23 filing attributed to Parker marked at least the second time a resident of Canada has filed a document that raised questions about whether a person north of the U.S. border was playing potentially costly “sovereign” games in the Zeek clawback actions in the United States. Bell alleged in September 2014 that Sandra Gavel of Sechelt, British Columbia, was a Zeek winner who owed the receivership estate nearly $90,000, plus interest. As was the case with Parker, Bell alleged that Gavel had received Ponzi proceeds that had come from Zeek victims. Gavel wrote a letter to the North Carolina court in October 2014 that sought to make Johns or the court itself a “respondent” and asserted Johns had made an “offer to contract” with her, according to records. Your offer to contract is hereby rejected as unacceptable. . . . I do NOT consent to the jurisdiction of any United States Magistrate, or the jurisdiction of any United States Article III Judge in the UNITED STATES DISTRICT COURT WESTERN DISTRICT OF NORTH CAROLINA . . . . (Id.). It is unclear whether, in light of the Defendant’s pro se status, the Court construes this letter as a Rule 12(b)(2) motion to dismiss for lack of personal jurisdiction or merely a failure to answer or defend. Defendants, of course, are entitled to defend themselves in actions brought in U.S. courts. In general, pro se filers — people representing themselves — are held to lower pleading standards. Regardless, they are expected to follow the rules of the court. In U.S. courts, judges have the power to construe a pleading by a pro se filer because the plain meaning may not be clear. When “sovereigns” are involved, however, it often is the case that the filers are being deliberately obtuse, sometimes as a means of harassment against judges, clerks and litigation opponents. One “sovereign” strategy present in the AdSurfDaily case has been described as “mailbox arbitration” — making an impossible demand of an opponent or perceived opponent, putting in on a tight deadline and declaring a “win” if the demand isn’t met. The practice needlessly adds to litigation costs and wastes the time of the courts. The June 23 letter attributed to Parker asserted that Johns had 30 days to produce his oath and other information. Failure to do so “is your tacit admission to perpetrating fraud upon Catherine Parker in her natural capacity,” the letter read in part. It has legal effect even though the name of Johns appears in all-uppercase lettering. NOTE: Our thanks to the ASD Updates Blog and its files website. Isn’t that a typical sovereign tactic, to attempt to find some miniscule irregularity, like “he didn’t say his oath right” or “he didn’t swear on whatever I think he should swear on” then claim the court’s authority is invalid? K Chang: Isn’t that a typical sovereign tactic, to attempt to find some miniscule irregularity, like “he didn’t say his oath right” or “he didn’t swear on whatever I think he should swear on” then claim the court’s authority is invalid? This document by the University of North Carolina School of Government provides a primer. It mentions oaths, brackets around Zip Codes, notices of dishonor, etc.